Description: I came across this photo and found it to be rather disturbing. 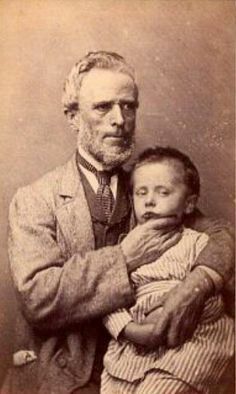 I realize that the man in the photo was trying to keep the child still for the photo, but geez, he could have done it a little bit more lovingly. He also appears very agitated. Crabby old bugger. I believe the child is sick and he might not so much be stern as thinking she may die. Wow....reminds me of my maternal grandfather he was very strict..